With all that has transpired in the course of the Conservative Party of Canada(CPC) leadership campaign, and specifically all of the slings and arrows so many Canadians have faced who've been so steadfast in support of Kellie Leitch, candidate for leadership of the CPC, I feel inspired to write this humble blogpost, in tribute to you all. The sense of patriotism, togetherness, and unity toward this truly noble, and worthwhile cause has been absolutely breathtaking..and that cause is the natural human desire for freedom, unencumbered by the shackles of globalism, elitism, and an increasingly tyrannical Liberal government. I've also seen a tremendous display of steadfast love for Canada as well, because Canada is indeed a very beautiful country, worth fighting for, and well deserving of all the pride bestowed on her. It was the great Winston Churchill that once said, "If you're going through hell, keep going." 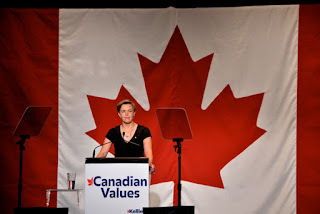 Over nearly the last 6 months, I've been awestruck, and amazed by a truly inspiring politician who most certainly puts life into that quote, and her name is Kellie Leitch, candidate for leadership of the Conservative Party of Canada(CPC). It is through following her candidacy, and the leadership election as a whole, that I find myself here, writing this blogpost. The leadership election will conclude on the 27th of this month, with a new party leader voted in, and it is with great enthusiasm that I, as an American, fully support Kellie Leitch being that new leader, for reasons I've written about in one of my previous posts, The necessity of Kellie Leitch...for Canada, and the United States.